Is the Long Tail of Residential Solar Installers Shrinking? Six companies installed nearly half of all U.S. residential PV last year. 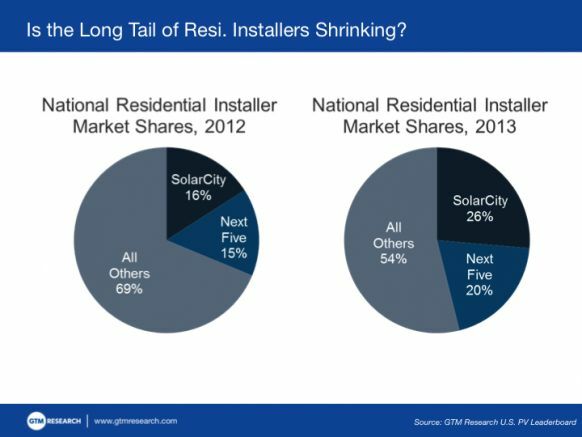 In a presentation at last month's Solar Summit, Shayle Kann, Senior Vice President of GTM Research, posed a question to the audience: Is the long tail of residential installers shrinking? Providing some context, Kann noted that just a few years ago, the residential installer landscape was dominated by small companies, many of which had converted existing business like home improvement or plumbing to focus on the emerging field. However, the market has undergone a dramatic shift driven in large part by new financing models, according to Kann. Homeowners who were unable or unwilling to muster the upfront cost of a system can now generate clean energy with small monthly payments. Companies employing these financing strategies have been aggressive and have grown quickly. According to the U.S. PV Leaderboard, SolarCity, the nation's leading residential installer and financier, installed more than a quarter of all U.S. residential PV in 2013, up from 16 percent the year prior. Though the companies filling the No. 2 through No. 6 spots in the rankings have shifted from year to year, their collective market share grew from 15 percent to 20 percent in the period 2012-2013. Are small installers in trouble? Not necessarily. Fortunately for all companies, the U.S. residential PV market tends to experience more consistent growth quarter over quarter than its non-residential and utility counterparts; it was also the fastest-growing segment last year. 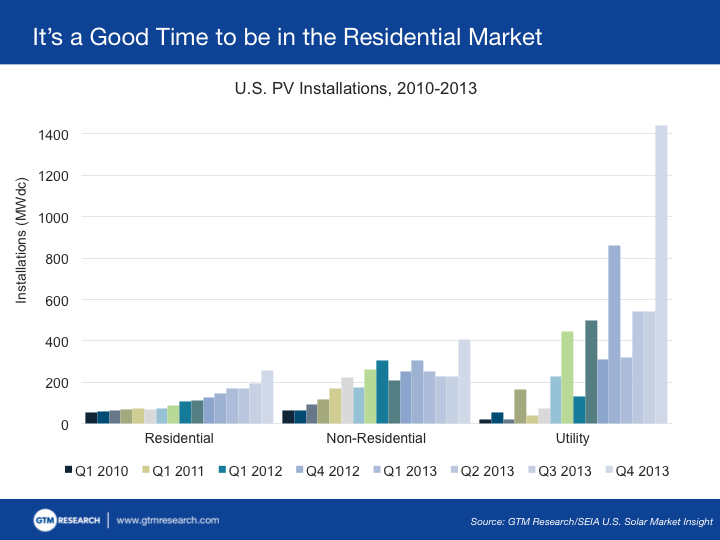 Between 2012 and 2013, the U.S. residential PV market grew 60 percent, increasing from 494 megawatts to 792 megawatts. 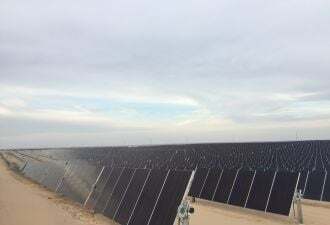 So even though the market share of the "long tail" dropped from 69 percent to 54 percent, the overall growth of the PV market allowed the smaller companies to grow by 25 percent collectively, installing 427 megawatts in 2013. That's up from 341 megawatts in 2012. 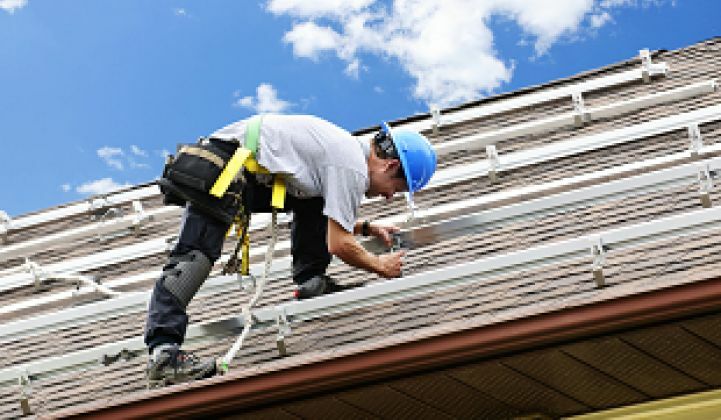 In a report released late last year, GTM Research solar analyst Nicole Litvak described customer acquisition strategies that residential installers are employing beyond new financing models. These include retail partnerships, door-to-door sales, enhanced customer service, and creative advertising campaigns. "NRG's and Sunrun's acquisitions of installer partners Roof Diagnostics Solar and REC Solar's residential dvision, respectively, could contribute to further consolidation, especially if the new vertically integrated divisions can scale operations quickly or acquire additional installers," said Litvak. "The fate of many smaller installers is in the hands of financiers like SunPower and Clean Power Finance, which offer services that allow them to compete with the national brands." At last year's Solar Market Insight conference, leaders from Vivint and SunPower debated the same question. Read the recap or watch a video of the debate here. The U.S. PV Leaderboard tracks residential and commercial market shares for U.S. installers.